Two thirds of all the world's illiterate people are women. On September 22, we will stand up for girls and their right to go to school and to learn to read and write. Let us join together to launch a campaign to advocate for a transformative new era in girls' education. Every girl has the right to a quality education that will ensure she has a lifelong way to protect herself, advocate for herself, learn what she wants to know and be who she wants to be. Every girl has the right to read and write words that will change her, and to write and tell stories to change the world. 2) Stand Up. 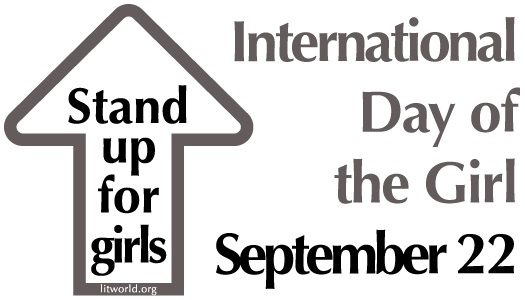 At noon your time on September 22, take ten seconds to physically stand up wherever you are (wear the Stand Up for Girls Badge- posted below!) to give recognition and awareness to the movement. Take a photo of yourself standing up for girls and post it on LitWorld's Facebook wall. 3) March. Organize a Stand Up for Girls March or event in your classroom, workplace or neighborhood on September 22 to bring awareness to your community about the urgency of providing girls with a quality education. Contact LitWorld for translations of this information, including alternate versions of the Avatar and Badge images. By standing up for all girls everywhere, we invest in our future. The Stand Up for Girls Rally is cosponsored by The Millennium Cities Initiative and Connect to Learn, projects of the Earth Institute at Columbia University and Millennium Cities and Villages across Sub-Saharan Africa, Asia Initiatives with Ashta no Kai and Arpana in India, and The Children of Kibera Foundation in Kenya. Newer PostDiana, Samantha and Liezza Hope You Will Stand Up for Girls September 22!